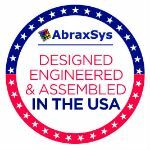 AbraxSys Corporation is a leading provider of industrial grade LCD displays including monitor configurations with sunlight readable technology, touch screen systems, legacy video timing formats, and large screen rugged digital signage displays for critical visual applications and harsh environments. Technical configurations also available for use in direct sunlight through higher nit luminosity and/or reflection reducing filtering technology. 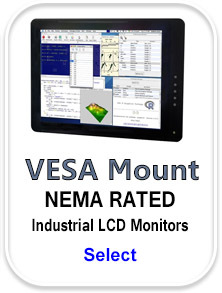 A comprehensive selection of industrial TFT monitors and Ingress Protection (NEMA) levels are available, including IP65 (NEMA 4), IP66 (NEMA 4X) and IP67. 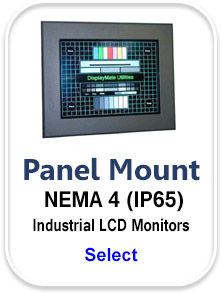 Numerous mechanical configurations are available for this rugged monitor series including NEMA 4 (IP65) Panel Mount, Stainless Steel NEMA 4X (IP66) Panel Mount, 19” RETMA Rack Mount, Industrial grade VESA Mount, and Rugged Tabletop. Sizes range from 6.4” through 32”, both 4:3 and 16:9 & 16:10 (wide) formats are available. 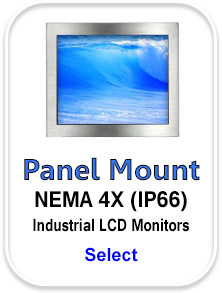 Various touch screen options, including Resistive, Capacitive, Surface Acoustical Wave (SAW) and Projected Capacitive are offered as enhancement features for this industrial LCD TFT monitor series. From traditional resolutions (VGA, SVGA, XGA, SXGA, UXGA and various Wide formats) are available. Low-Scan “Legacy” video formats are also available. 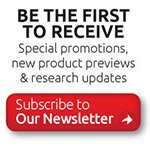 The innovative technology that goes into liquid crystal displays, or LCDs, outperforms that of the CRT displays of the past. CRTs were the standard of home personal computer and industrial computers for most of the 90’s. With the rise of LCD monitors, it is difficult to find the once standard tube monitors. 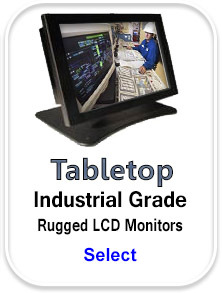 After the proliferation of LCD screens came true “industrial” grade, rugged monitors These meet quality standards so far above what a typical screen would ever need to endure. It is interesting to learn that industrial grade LCDs have an extended back-light half-life than a normal display and that if they are treated appropriately, they will operate much longer a normal LCDs, sometimes over 100,000 hours longer. Rugged, industrial LCD displays are very different in quality from the LCD you normally use in a retail or home environment. 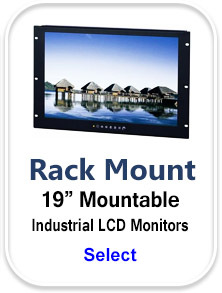 Industrial grade displays outperform the quality of regular LCDs and with thin film transistor technology the true industrial LCD monitors now produce a better picture quality along with durability. It may seem like overkill, but these mission critical LCD monitors often need to operate high dust, high moisture and below zero temperatures (sometimes below -40C, and heats well over +60C degrees). These rugged displays need to be able to withstand extreme temperatures, dust and debris, as well as being durable to the industrial work environments. Industrial monitors with touch screen are also more common in the industrial market along with being sunlight readable through higher brightness or reflection reducing technology.